Title: 'Asia ex magna Orbis terre descriptione Gerardi Mercatoris'. 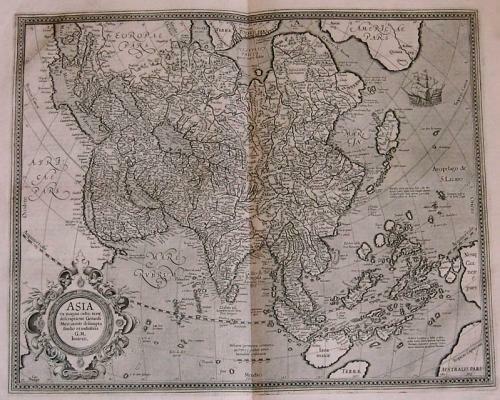 A finely engraved map of Asia from the Mercator Hondius Atlas. First issued 1595, this map of Asia still has several interesting points: Japan stilll has an oval shape with a chain of islands to the south, despite the inclusion of a much more accurate map in the same atlas; an island marked "Polus Magnetis" appears just above the Straits of Anian, away from a polar landmass; and north-west America appears, with two towns within the kingdom of "Quivera". KOEMAN: Me 23a. Typical classic early embellishments include the sailing ships and the ornate title cartouche.